Aman is currently a junior undergraduate majoring in Physics and Astronomy and minoring in Mathematics and Computer Science at the University of Wyoming. He has also completed a student exchange program during my junior year at Swansea University in Wales. 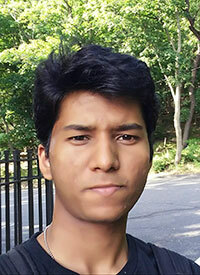 Aman is an international student from India and began college in the United States in 2015. Aman plans on going to go graduate school to pursue Astronomy. Research experience includes working at the Red Buttes Observatory and the Wyoming Infrared Observatory on topics including Exoplanet detections and atmosphere characterizations. This upcoming summer, Aman will be working on Radio Astronomy at the Green Bank Observatory in West Virginia. Aman has been an active SPS member since my freshman year and served as the Vice-President for the group during my sophomore year. Aman attended PhysCon 2016 in San Francisco. Aman has helped organized several fundraising events for the group as well as outreach activities, sometimes in collaboration with the University of Wyoming Department of Physics and Astronomy. Other leadership roles include community service with the SLCE (Student Leadership & Community Engagement) and serving as the Treasurer of the Indian Student Association.